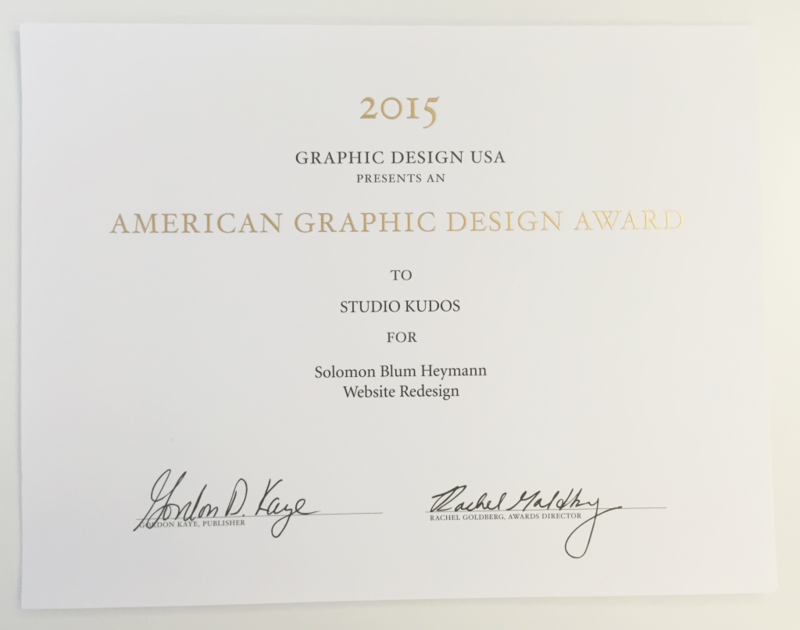 Solomon Blum Heymann LLP is proud to announce that our website has won a “2015 American Graphic Design Award” from Graphic Design USA. Each year, they host an annual competition aimed at showcasing the power of website design and its ability to better online communications between users and businesses. SolBlum.com received an award for “Website Redesign,” which was presented to our design firm Studio Kudos. In 2015, Solomon Blum Heymann LLP decided a redesign was in order to better align our website with the true aesthetic of our firm. Our goal was to not only make our site an extension of our image, but to enhance the user experience for our current and potential clients as well as colleagues. The site redesign gives visitors clear navigation through the site – allowing them to easily explore our firm’s international legal practices, firm recognitions, and the affiliations we have with organizations overseas. The site also gives users the ability to view in-depth profiles of our international business attorneys which include downloadable vCards for direct contact with a specific attorney. Our resources section and blog also aim to enhance the user experience – giving users valuable legal information pertaining to international and domestic businesses. Furthermore, a major area of emphasis during the redesign was to portray an accurate image of our law offices in NYC. As opposed to using stock images, photography from our New York headquarters is featured prominently across the site. Solomon Blum Heymann LLP would like to thank Graphic Design USA for the recognition and Studio Kudos for the exceptional job they did with the website. For inquires, please contact our NYC law offices through the form on our website.